IBM Watson and Healthcare Big Data Analytics | What's The Big Data? To achieve that goal, MD Anderson has also partnered with PwC for the development of the cloud information interchange and with AT&T for a secure, dedicated network. It is now piloting its first network link, to one of its network partners in New Jersey. Still, one of the lessons learned so far is that “there will always be a question the OEA was not trained on,” so a teleconferencing component has been built into the system. Other lessons include the need to provide mobile-device-based solutions, the challenge of teaching the OEA the relative value of each piece of information, and that the expert system “is very valuable from a learning perspective,” as a teaching tool for doctors in training. It also turned out that the OEA is useful in helping research nurses screen patients for clinical trials. Before, the nurses were often considering only the trials they knew about. Now they have at their disposal a clinical trial recommendation engine that screens through all the available trials and an expert system that helps with monitoring the patients participating in the clinical trial. The development of the OEA is a never-ending journey. Healthcare is a complex and constantly changing endeavor involving research and practice, experiments and established procedures, professionals, institutions, and providers of all sorts, and most important of all, the people they serve—both patients and everybody else trying to keep themselves healthy. Over the last decade healthcare has gone, at long last, through rapid digitization, transforming mounds of paper into electronic records and introducing computers to many aspects of the physician’s work. As in other fields, the introduction of computer technology provides opportunities for reducing costs and increasing quality and effectiveness, while at the same time increasing the potential for errors caused by over-reliance on technology and automation. Similarly, while digitization facilitates the collection and sharing of practical knowledge and research expertise, it also produces mountains of data that threaten to impede rather than accelerate progress. IBM Watson helps in processing and analyzing this data and presenting it as confidence-level-ranked suggestions and recommendations. At the IBM event on September 10, Dr. Jeff Burns described how OPENPediatrics doesn’t tell the physician “do this,” but rather “tells the doctor what to think about.” OPENPediatrics is a Boston Children’s Hospital-led initiative bringing medical knowledge to pediatric caregivers worldwide (currently reaching 900 hospitals in 127 countries). IBM and Boston Children’s Hospital plan to develop “solutions for commercialization, initially pursuing applications in personalized medicine, heart health and critical care,” leveraging Watson’s genomic, image, and streaming analytics capabilities. At the new Watson Health headquarters in Cambridge, Mass., Dr. Watson—and 700 other IBM employees—will be joining more than 600 Massachusetts-based life sciences companies and research organizations employing about 60,000 people. 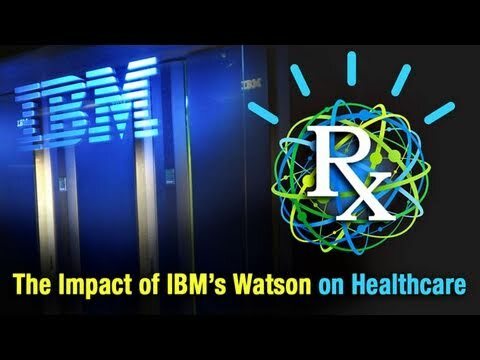 IBM plans to open there an interactive Watson Health Experience Center (a demonstration center for IBM customers) and establish a dedicated Health Research lab. “We have to do it as a community,” Mike Rohdin declared at the event. Other participants, executives from Yale University, Sage Bionetworks, Medtronic, CVS Health, Modernizing Medicine and Teva Pharmaceuticals, echoed the sentiment. And Like Rhodin, they stressed putting people at the center of their efforts to improve healthcare, highlighting the specific goal of helping patients manage their disease. Digitization—and smart analysis of the data it generates—helps in building a community around shared knowledge. The competition for profits and prestige among healthcare providers, however, while driving the innovation that may lead to better healthcare, also could stand in the way of cooperation and knowledge sharing. It may also lead to hasty development of technology-based solutions without a careful evaluation of the actual benefits and potential risks. Let’s hope that IBM and its partners will do everything they can to uphold the medical community’s tradition of controlled experiments and contributing to the ever-growing public repository of knowledge of what works and what doesn’t work in healthcare.